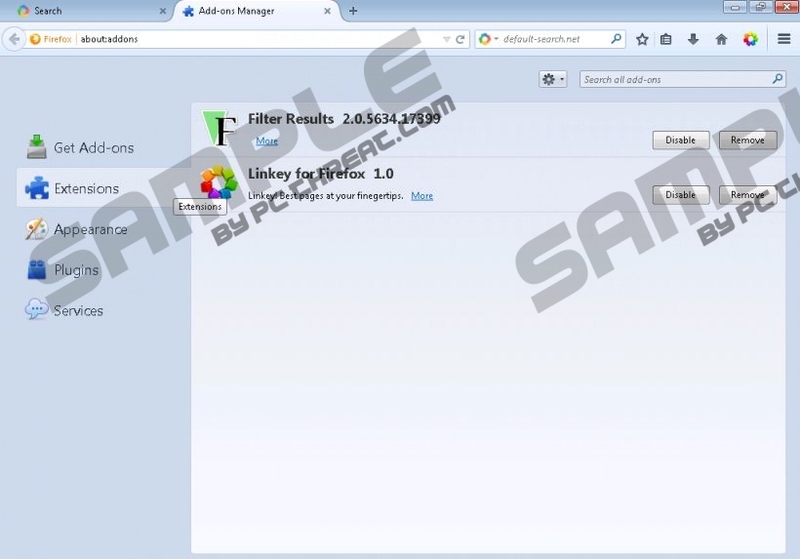 Filter Results a recently developed and released adware-type program that is bound to irritate users with constantly appearing advertisements. The ads are exclusively supplied by unreliable advertisers, so we recommend that users remove this infection as soon as possible. The promotional slogan of Filter Results is “The web can lead to information overload, that’s why you need Filter Results.” But our security experts say that you definitely do not need it, because it is malicious, and no dull promotional slogans can disprove that. If you have browser extension called Filter Results, then you might want to read this article. In truth, Filter Results cannot filter any results, it is a blatant lie. In fact so such application can affect the search engine, an application would be incapable of dealing with the amount of information shown. If the developer’s idea of filtering results is showing third-party ads, then they have succeeded. But, there is a slight problem. The developers (whoever they are) do not seem to endorse the content that they promote. They will not take any responsibility for the damage that might be caused to your computer. Since the developers are only interested in making money, they do not hesitate to do business with shady third parties who might want to promote malicious content. Indeed, having Filter Results on your computer might subject you to ads that promote malware downloads. Your PC might get infected with rogue application, Trojans, browser hijackers, and so on. If you want to avoid all that, please remove Filter Results. However, unreliable ads are not the only thing you should be worried about. The program is known to keep tabs on the user’s browsing activities. They customize the advertisements based on the users browsing preferences. Browsing history, IP addresses, browser settings, computer specifications, emails, usernames, can be obtained by the developers via their application and the promoted websites that you visit and register on. The collected information is used to tailor specific advertisements to unique users to increase the probability of a click. We are of the opinion that users should not tolerate unsanctioned information gathering. We hope that the information provided in this article was useful. We hope that now you are ready to remove the application, because it can only compromise your computer’s security with its annoying advertisements. There is no need to remove the infection from the browser, since doing via the Control Panel will be enough. Identify Filter Results and click the Remove button. Identify Filter Results and click the Uninstall button. Quick & tested solution for Filter Results removal.